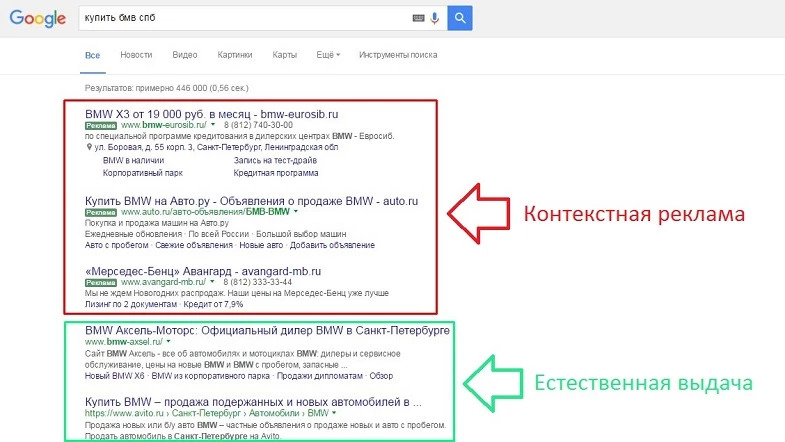 So, there are two of the most popular search engines: Yandex and Google. We need to make sure that our website is not only in the search result (among all the references issued on the user's request), but also in the top, or rather, among the first issued results. This type of advertisement works like an auction. Each advertiser sets the price for one click, after which the services specified above determine the place of advertisement in the list, and whether it will be shown at all. The main disadvantage of this method: if you are selling goods / services from a fairly popular area, larger competitors, with larger capital, can easily push you out of this top. As you can see, after contextual advertising there are other links, the so-called links of natural extradition. Websites get there with the help of SEO-promotion. Search engines themselves determine the order of links, using special algorithms. Let's look at how to "please" the search engine, get into it and get onto the top. Search engines algorithms are arranged in this way: the older the site, the higher in the list it will be. It turns out that the brand new website is almost invisible, and the search system can pay attention to it both in 3 weeks after the creation, and in 3 months. In order to bring the website higher in the list, it should take at least 6-8 months, and still there are no special guarantees for this. Do not despair, there are some ways to get through it faster! Place the website in an open access. The sooner you do it the better. Now it is the time to express yourself. Show yourself to the search engine. You register the website in Yandex.Webmaster and Google Search Console. You can confirm the right to own the website there.For this you will need @ yandex.ru and @ gmail.com. mail boxes. After confirmation, Google will pay attention to the website in a week, Yandex - in one to two weeks. We need to create the, so-called, semantic core of the website. Make a list of words that describes the website and the scope of your activities the best . This will help the search engine to understand on what requests to issue your website. A good tool for searching for keywords is Yandex Wordstat. You enter the phrase that describes your activity and the service finds the most suitable keywords. In Yandex Wordstat there are charts of the best selling words, which is cool. Thanks to this function, you can choose the most selling words. The texts will need to be written by yourself, because the search engines hate the plagiarism. The search engine automatically forgets about your website, after seeing the copy-paste. Do not be lazy to check the text for the uniqueness, especially if you are rewriting articles. For the search engine, they are important. These tags represent your website in the form of the code and tell the search engines everything about your website. URL - the address of the page. Title - the title of the page. Keywords - that describe the content of the page. Description - a short description of the page, in general. Meta tags are visible even to users, so pay proper attention to fill them. We hope our tips will help you to promote your website. Do you have any questions? We are waiting for you in our groups in VK and FB. We wish you a successful promotion!